SEATTLE, WASHINGTON, UNITED STATES, January 16, 2019— The Artificial Intelligence of Things, otherwise known as AIoT, represents the use of various AI tools, such as machine learning to improve the functionality of IoT networks and systems. Mind Commerce sees AI providing IoT learning and decision making capabilities while IoT provides AI algorithms with inter-system connectivity and data exchange between devices, platforms, applications and the “things” that are the focus of an IoT network. From a communication service provider perspective, AIoT solutions will evolve to provide network management and optimization. This will be a benefit for existing networks as well as evolved LTE, IoT, and soon to be launched 5G networks. 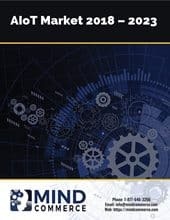 Mind Commerce sees commercialization of 5G simultaneously accelerating AI and IoT for converged AIoT supported applications and services. The total AI driven networking solution market is expected to reach $5.8 billion by 2023. A relatively small, but fast growing portion of the global market, AI chipsets is anticipated to reach $6.6 billion by 2023. Mind Commerce sees North America leading the global AI market with 34% market share through 2023. One of the fastest growing AIoT market areas will be data management and support for IoT related Data as a Service (DaaS) offerings. The use of AI for decision making in IoT and data analytics will be crucial for efficient and effective decision making, especially in the area of streaming data and real-time analytics associated with edge computing networks. Real-time data will be a key value proposition for all use cases, segments, and solutions. The ability to capture streaming data, determine valuable attributes, and make decisions in real-time will add an entirely new dimension to service logic. In many cases, the data itself, and actionable information will be the service. The growing amount of human-oriented and machine generated data will drive substantial opportunities for AI support of unstructured data analytics solutions. Data generated from IoT supported systems will become extremely valuable, both for internal corporate needs as well as for many customer-facing functions such as product life cycle management. In many cases, the data itself, and actionable information will be the product, often delivered in a DaaS market model. As the industrial IoT market in particular evolves, there will an increasingly large amount of unstructured machine data. This rapidly growing amount of machine generated industrial data will drive substantial opportunities for AI support of unstructured data analytics solutions. Artificial Intelligence of Things (AIoT) Solutions: AIoT Market by Application, Service, and Industry Vertical 2018 – 2023 provides a multi-dimensional view into the integrated AI+IoT market including analysis of embedded devices and components, embedded software, and AI platforms. This research also assesses AI support of IoT hardware, software, and solutions including embedded IoT and non-IoT devices, embedded components (including AI chipsets), embedded software and AI platforms, and related services. This AIoT market report also evaluates leading AIoT market solution providers including hardware, software, integrated platforms, and services. The report includes quantitative analysis with forecasts covering AI technology and systems by type, use case, application, and industry vertical. Forecasts also cover each major market sector including consumer, enterprise, industrial, and government. This report also represents the most comprehensive research covering core IoT hardware, software, and firmware as well as supporting technologies such as AI in edge computing. To access the AIoT Market Report, please click here.